Starches are polysaccharides produced by all green plants to store energy. They are the most important carbohydrates in the human diet, present in potatoes, wheat, maize (corn), and rice. Pure starch is a white powder insoluble in cold water. It consists of two types of molecules: the predominantly linear helical amylose (20-25%) and the lightly branched amylopectin (5-80%). 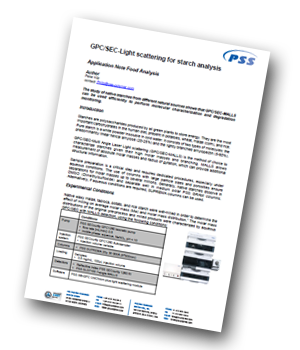 GPC/SEC-multi angle laser light scattering (GPC/SEC-MALLS) is the method of choice to characterize starches given their high molar masses and branching. MALLS allows measurement of absolute molar masses and radius of gyration, which can provide additional structural information. Native waxy maize, tapioca, potato, and rice starch were wet-milled in order to determine the effect of milling on average molar mass (Mw) and molar mass distribution. The molar mass distributions of the original pre-process and milled products were characterized by aqueous GPC/SEC with MALLS detection. The molecular characterization of native and milled starches from different natural sources shows that GPC/SEC-MALLS can be used efficiently to study the degradation. If sample preparation has been performed properly and proper GPC/SEC columns with wide pores and large particles are used, sample recovery is close to 100% and starch molar masses separation covering monomers to several 10 million g/mol are possible.